April 10 is Equal Pay Day, a symbolic day dedicated to raising awareness of the gender pay gap and showing how much farther into the year a woman has to work to make the same wage as men with similar experience and qualifications. According to a new CareerBuilder study, female workers are nearly three times more likely than their male counterparts to think there’s a pay disparity at work. Female workers also tend to be less satisfied with opportunities for advancement at work. Only 34 percent of women are satisfied with career advancement opportunities at their current employer, compared to 44 percent of men; and 30 percent of women do not feel they have the same career advancement opportunities as men who have the same skills and qualifications at their organization, compared to 12 percent of men. They are also less likely to be satisfied with training and learning opportunities at their employer than men (43 to 55 percent). Encourage transparency of pay. Usually, workers are discouraged from sharing salaries and bonuses. Greater transparency could allow women to fight for pay equality where they currently work. Fight bias during the hiring process. Don’t discriminate. Go for the right person, with the right qualifications, at the right time. Check out this article about salary transparency and how it may help mitigate the pay gap. Did you hear? 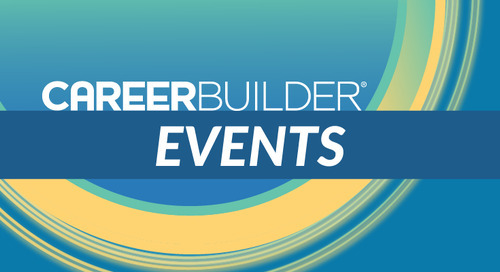 CareerBuilder was recently at SHRM Talent Management 2018. Here's a recap! A list of conferences and events we'll be participating in this year.